Rapunzel/Jack Sparrow. Animated & Live-Action Crossover.. Wallpaper and background images in the croisements Disney club tagged: crossover disney animated live-action rapunzel jack sparrow. 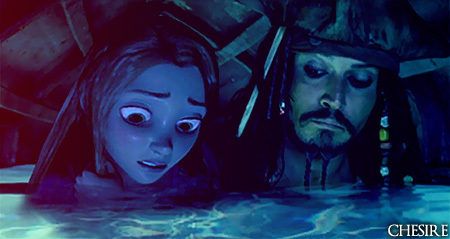 This croisements Disney photo contains jacuzzi and bain à remous. Wow, they really seem together. Good job! Okay, I usually don't like human/animated crossovers, but this one is really good. Sorry if i commented with :O-jaw drop, i'm just kind of surprised to see a live action character and animated character in the same image.